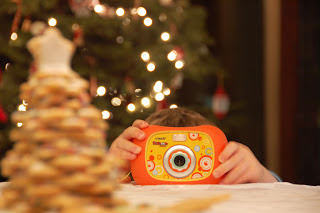 Cory got a camera for Christmas (the vTech Kidizoom) and has been having a blast taking pictures of random things. But how do you explain things to a three year old so that all his pictures don't end up being either a) blurry b) back lit or c) too small to identify? I've got a few tips that have helped me along the way. Hopefully they will help you if your kid has a camera, and maybe you'll learn something yourself too! Look around you and see where your primary light source is whether it's the sun*, a lamp, or simply the biggest window in the room. Then face your subject (or object) towards that light and put yourself between the light and the subject, but slightly off to the side so you don't make a shadow. The subject can either face the light entirely and you'll get a slight profile shot, or face you and you'll get a bit of side light. Either way this makes your picture turn out with your subject lit, and not the background! This is my number one tip! *If the sun is your light source it's best to be in a shaded place somewhere or you'll get squinty eyes and harsh lighting, but still face towards the direction of the sun. This can also be achieved by zooming in, if your camera has that function. The point of this is to make the subject really stand out in your picture. If what's really important is the eyes, it's okay to not show the whole body or even the whole face! You'll also get a lot more detail this way. You can go overboard with this and never have a picture that shows any background, but I think most people are a bit afraid to zoom in! Also in the case of a scenery shot with people in it, like at the Grand Canyon, a great way to have the people larger is to position them closer to the camera, but off to the side and still have the scenery in the background! You can definitely get some cool effects with blur, but when that's not the point of the picture you have to be a little more patient! Show your kids how to brace the camera against anything nearby - the edge of the table, a chair, even the floor. This one's mostly for us moms! Obviously there are times when using a flash is necessary and the memory is more important than the perfect quality photograph. But if you want a great picture of your kids look for natural light (see #1!). Go outside whenever possible or get close to a big window. Try the hour just before sunset for some great golden light. Any other tips you would give to a kid? Or a mom photographer? Oh, and if you'd like to see some of Cory's work you can see the blog that he keeps... with my husband as a very hilarious ghost writer! Disclaimer: The vTech camera was purchased with family money as a gift. I am sure vTech has no idea who I am or any knowledge of my blog. That said, we really think it's a great little camera for the price and I don't have to worry about it getting dropped and broken! I think at this point we don't worry so much about working on taking good pictures. Right now we just let them play with the cameras that we own so that they can learn how they function and take pictures of whatever they want, whenever. Just make themselves familiar, etc. Instruction, if they want it, would come later. For now it's just fun. WHich I think is a good start for photos. yeah, I'm a constant work in progress when it comes to good photos. My current tip to my 5 year old? Don't take a picture of momma when she's in her nothings. It's key.